How does the therapist begin psychotherapy? How, that is, does she conceptualize the needs of the patient while simultaneously enlisting him or her as an active partner in formulating an individualized working plan? And how should supervisors teach the skills needed to make the intake procedure truly the beginning of treatment? 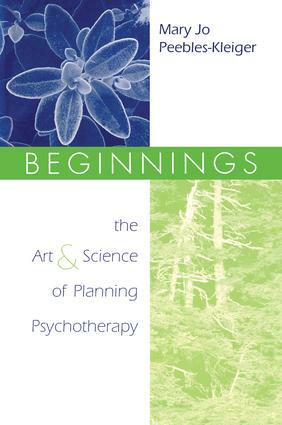 In Beginnings: The Art and Science of Planning Psychotherapy Mary Jo Peebles-Kleiger tackles these and other questions in an authoritative manner that draws on the cumulative experience of the outpatient department of the Menninger Psychiatric Clinic. Peebles-Kleiger's elegant synoptic discussions of the major categories of psychological dysfunction and the different treatment strategies appropriate to them are carefully calibrated, with actual examples, to the limits and opportunities of the first sessions. Of particular value is her unusual capacity to articulate patients' various difficulties in forming and maintaining an alliance, and then to show how such difficulties feed back into the clinician's interventions in the first few sessions. In this manner, she illustrates how potential treatment obstacles-- difficulties in affect regulation, in reality testing, in conscience formation, among others--can be assessed and subjected to trial interventions from the very start. Skilled in various psychodynamic and behavioral approaches, from psychoanalysis to hypnotherapy, Peebles-Kleiger consistently advances an integrative approach that cuts across specific modalities and combines sophisticated psychodynamic understanding with the fruits of empirical research. Both primer and sourcebook, Beginnings: The Art and Science of Planning Psychotherapy fills a niche in the literature so admirably that clinicians will find it indispensible in planning humanely responsive treatment in an increasingly complex therapeutic world. "A superb integration of theory, empirical reseach, and clinical wisdom. Beginnings brings together in a wonderful way advances in psychological research, psychotherapy theory, and practical planning of a treatment intervention. It presents the best available introductory text to guide the young psychotherapist through the labyrinth of theories, findings, and recommendations that can often destroy the natural creativity of the beginning practitioner or even those of us who are more experienced." "Dr. Peebles-Kleiger has written a masterful and comprehensive summary of how the psychotherapist should think in developing a psychotherapeutic treatment plan for patients. She accomplishes the difficult task of being both scholarly and practical at the same time. Her book will be equally useful for students and experienced clinicians alike." "This comprehensive guide to planning psychotherapy is noteworthy for cutting across a broad range of treatment models and exploring universal factors that clinicians should consider in the beginning phase of psychotherapy. Peebles-Kleiger describes and illustrates the treatment planning process in a step-by-step, highly readable, and user-friendly manner while also showing how it is grounded in clinical writings and research. Any clinician or trainee who is engaged in, or learning about, the practice of psychotherapy will find Beginnings a valuable guide and an important resource." What Do We Mean by Diagnosis? Alliance. Focus. History Taking: Comprehensive or Selective? Patient Activity. What Material Is Important. How Can We Be Sure? Trial Interventions and Feedback. The Concept of Underlying Disturbance. Deficit. Characterological Dysfunction. Conflict. Trauma. Enhancing the Patient's Ability to Form an Alliance. Reality Testing and Reasoning. Emotional Regulation. Relatedness. Conscience. The Psychological Costs of Change. The Patient's Learning Style. Expectations. Priorities and Modalities. A graduate of the Topeka Institute of Psychoanalysis and former member of the medical staff of Chestnut Lodge Hospital, Mary Jo Peebles-Kleiger, Ph.D., worked, supervised, and taught at the Menninger Clinic for nearly two decades. In addition to being a psychoanalyst, she has trained in biofeedback and EMDR and is board-certified in both clinical psychology and clinical hypnosis. She is currently in private practice in Bethesda, MD.